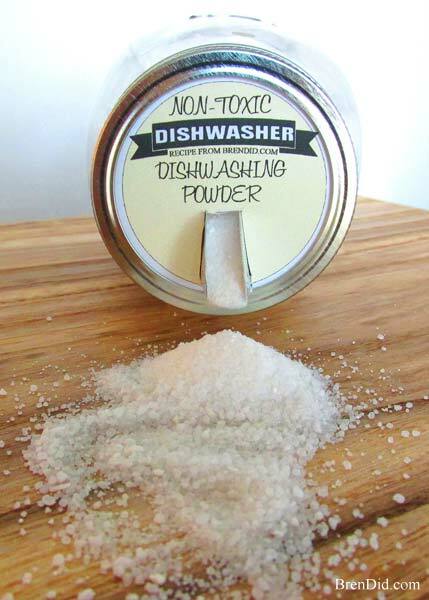 This all natural homemade dishwasher detergent is made from simple, non-toxic ingredients that will keep your dishes clean. This post contains affiliate links. Read more on my Policies & Disclosures page. ***Green cleaning update: This was my very first green cleaner. I no longer use this recipe as it mixes an acid (citric acid) and two bases (baking soda and washing soda). Learn more about why I stopped making this recipe here. I apologize for any inconvenience this may have caused. ***What I use to green clean dishes in the dishwasher: I either make my Fresh Lemon Homemade Dishwasher Detergent or purchase this dish washing powder. In a pinch I fill the detergent dispenser of my dishwasher with baking soda and add 3 drops (ONLY 3 drops) of hand washing detergent (I like this liquid detergent) on top of the baking soda. It started with mud pies when I was a little girl and it has never stopped… I have an undeniable urge to try making things myself. In fact, I now make many of my own cleaning products since I want my home to be as toxin free as possible. It all started with All-Natural Borax Free Laundry Detergent. 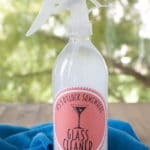 The recipe was such a HUGE success that I began replacing more and more of my store bought cleaners. 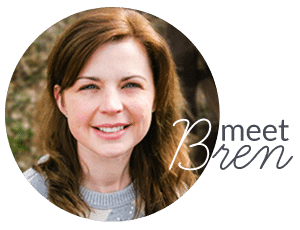 I began looking up my favorite cleaning products on the Environmental Working Group’s Consumer Guide after I learned about the dangerous chemicals in some commercial products. I was shocked to learn that my store-bought dishwasher detergent had scored a C for problems such as cancer and respiratory effects. A homemade dishwasher powder could eliminate dangerous chemicals and additives. A homemade version could score well on the EWG scale. 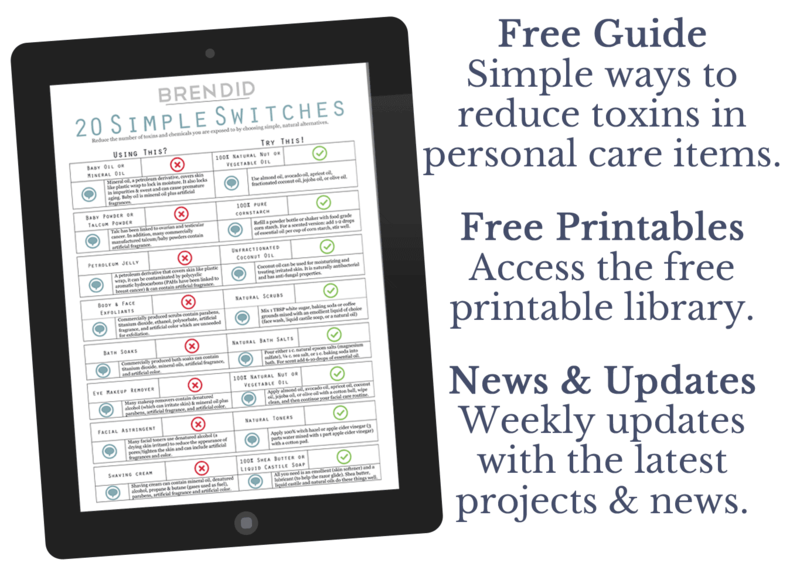 Borax scores an F on the EWG scale for respiratory effects and developmental toxicity. Borax use is controversial in “green” circles; it is a naturally occurring mineral, but it is also toxic (it can be used to kill ants and cockroaches). Borax has been banned as a food additive by the FDA, so I personally do not want to use it on my dishes. Read more about the Borax controversy and decide for yourself at Crunchy Betty or MNN. LemiShine can be found at many retailers, but the EWG does not have any data on it. The company does not disclose its ingredients. Companies in the US are not required to disclose all chemicals, but a product without an ingredient list sets off wild alarm bells in my mind! 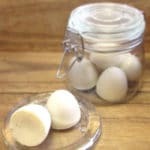 My all-natural homemade dishwasher detergent is significantly cheaper than my old store bought dishwasher detergent AND it rates an “A” on the EWG scale! It makes 28 oz. for $2.51 or 56 loads at $0.04 per load! The best part about this dishwasher detergent? It works great! It dissolves well (unlike some powdered dishwasher detergents). The dishes come out sparkly and clean with no spots or gritty residue! Like using a rinse agent? Place a small dish of white vinegar (1/8 to 1/4 of a cup) on the top rack of your dishwasher. It is a cheap, green, and non-toxic rinse aid. 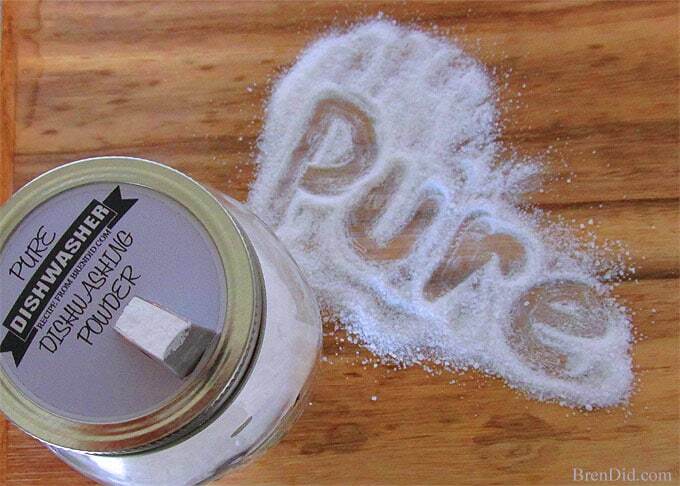 Place all ingredients in an air tight container or jar, stir well or cover and shake to combine. 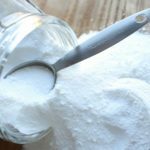 Use one tablespoon per load in your main dishwasher detergent compartment (you many also place the detergent in the bottom of your dishwasher before starting). For EXTRA dirty dishes or very heavy loads boost the detergent by placing it in the bottom of the machine, then add 1/8-1/3 tsp of liquid Castile soap (I use Dr Bronner's Unscented) or 2-3 drops of natural hand washing detergent in the detergent dispenser , and use a white vinegar rinse. 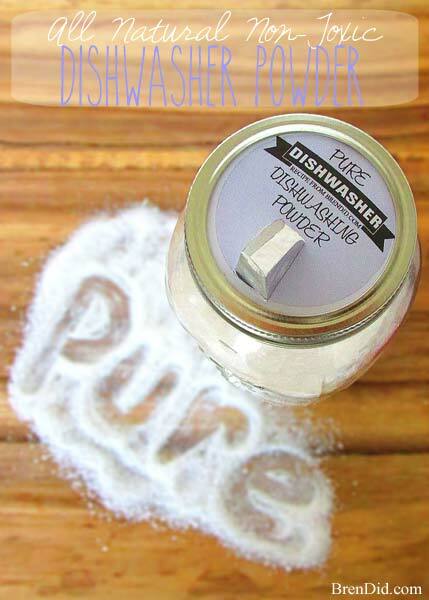 Powdered dishwasher detergent can turn into a rock hard lump if not stored correctly. The citric acid can make the mixture harden if there is humidity or moisture in the air. 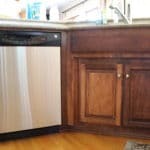 Since most people store detergent under the kitchen sink this can be a BIG problem! Mix the detergent in a large bowl then leave it uncovered for a few days. Stir the mixture a few times a day to remove clumps. 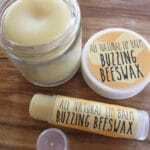 Once the clumping stops store it in an airtight jar or plastic container. Save a silica gel pack from a pair of shoes and keep this in the jar with the detergent. 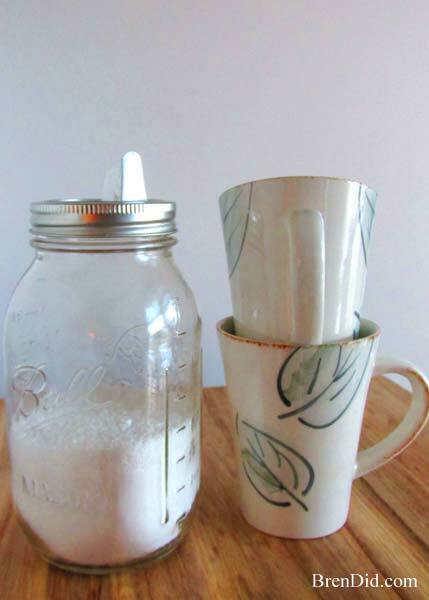 Fill a little mesh or muslin bag with uncooked whole grain rice and keep in the jar with the detergent. 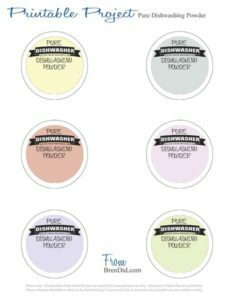 Grab a printable label for a Mason jar to store your dish washing powder in my free printables library. I made my pour spout dispenser from an empty cardboard salt container; get the full instructions at The Craft Patch. 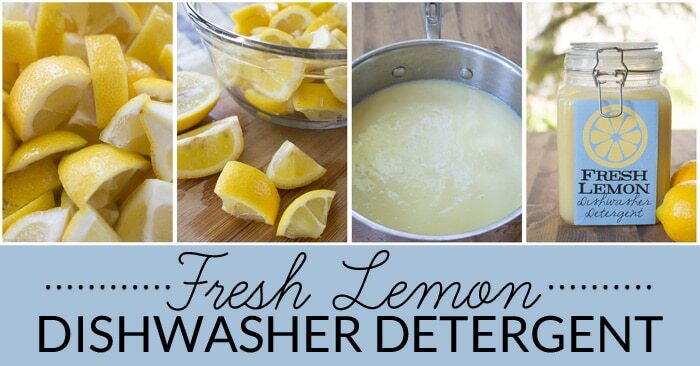 If you are looking for a gel dishwasher detergent try my Fresh Lemon Homemade Dishwasher Detergent – it uses just lemons, vinegar, and salt. Like my all-natural cleaning products? Sign up for my newsletter and never miss a thing! Elizabeth, it’s the top of a salt carton. Just trace around your jar top and pop it in. I would stop using the detergent immediately and clean your machine using CLR (full instructions here). The mix is not working with the water in your area. I suggest looking for a natural, store bought alternative. I love this one. Hi,I’m confused, I just read all your great info on what green cleaning items should not be mixed (baking soda/washing soda and vinegar). But this recipe uses citric acid which surely reacts with both alkali sodas as soon as it gets wet? I can’t see the difference, surely they would just fizzle and neutralise each other? Please advise? Great question. This recipe is from before I started breaking down the chemistry behind green cleaners. I need to update it with a note of caution. 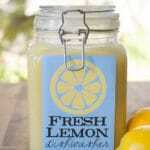 My fresh lemon dishwasher detergent is a newer recipe that uses all acid to clean. I’m currently in the middle of a natural dishwasher detergent test that will hopefully yield a better powdered solution. I was wondering if citric acid ruins metal cutlery in the dishwasher. I’ve never had a problem using it on my cutlery, you should check your manufacturer’s recommendations.